Greetings from the Asylum: Let Us All Give Thanks! Halloween didn't turn out so well here at the Greetings From the Asylum. It involved some gastrointestinal distress followed by a garbage bag full of bathroom mats. (In my defense, they were really old and beginning to fray before the "incident." I put "incident" in quotation marks because that is the word my seven-year-old used when asking if it would keep him from trick-or-treating. Yes, unfortunately, it did. Here is our delightfully happy jack-o-lantern. It made me smile for days! I dare you to look at this photo and NOT smile! You can't do it! I just love the freckles! In my humble opinion, all jack-o-lanterns should sport freckles! I have this strange space-sucking shelf in a long hallway in my house. I usually use this space as a catch-all of junk. (You know you have one in your house, we all do!) For the holidays I try to keep it clean-er. Do you see my "junk" in the background? A close-up of some of my junk. Funny (now) story: All of my smoke detectors went off at 3:20 in the morning a few nights ago. Can you say adrenaline rush? Whew! The batteries are out because they continued to scream even after they had been forcibly ripped from the ceiling. They each gave a final plaintive cry as the last of their power drained away. SIGH! It took my husband and me over an hour to go back to sleep after that, but our children slept right through it all! My cousin made these glittered pressed leaves and sent them to me. They look great scattered around with the other holiday stuff! We won this centerpiece at a company picnic several years ago for my husband's previous employer. It still looks great! I have had these little metal pumpkins for YEARS! I love putting electric tea lights in them and watching the shadows dance on the walls. This is my FAVORITE thing! I made this write-on thankful plaque two years ago when I got the inspiration HERE from Bev at Flamingo Toes. It has been a big hit ever since! My kids love to write what they are thankful for! UPDATE: I used embroidery to make the words after choosing a cute font on my computer to use as a pattern. Use colored Dry Erase markers. I like the fine point! You can write on your favorite thankful thing and wipe it off tomorrow and write something new! AND speaking of Bev.....I got to meet her! You heard that right. I met the world-famous Bev from Flamingo Toes!!! Bev was a few miles down the road so I simply had to go and say hello. She is super nice and has a great smile! Seriously, check out her blog. 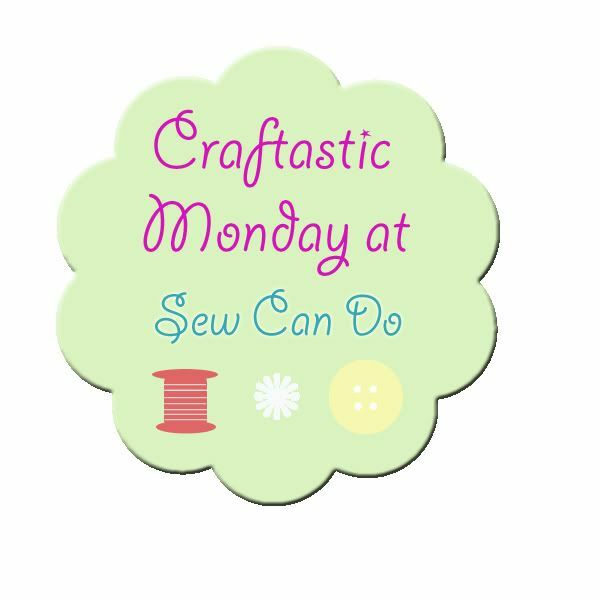 She has TONS of fun ideas especially if you like jewelry or sewing or home decor or whatever! Highlight of my November! I made these Pilgrims several years ago. My kids just love them. See, they love them. They did question the pumpkin and the pie though. I don't know why, they make sense to me. I made this Mod Podge masterpiece about four years ago. Here are some close-ups of my favorite letters. The letter and background are smooth, but the flower, button, and cord are 3D. I love the sparkly leaf stickers and the square brads. When I made these I had to put everything away before I could finish. I had all of the letters laid out just right. Unfortunately, I needed the stove to cook dinner. I took pictures of each letter before cleaning up my supplies. It made it so easy to come back and remember what I had designed in my mind. Also, I used sticky back felt on the bottoms of all of the letters. This keeps the letter blocks from sliding around on the shelf and also keeps any of the paint from coming off on the counter. It is a win-win! Well, there is the sum total of my Thanksgiving decor. I am open to any ideas you have to make my house a little more festive! I would love it if you became a follower of Greetings From the Asylum. I can also be found on Facebook and Pinterest. Come check me out! Remember to add Greetings From the Asylum to your news feed on Facebook so that you can see all of the latest updates! P.S. Add all of your favorite pages to your news feed. Your page administrators will love it! Thanks for the visit! Come back soon! YAY!!! I am amazed that those leaves made it through the storage time!! I'm SOOOOO glad!! I LOVE your arrangement!! and everybody LOVES our "Give Thanks" too!!! THANK YOUUUUUUU! Tanya - all of your decor looks so pretty and festive!! It was so great to meet you - (I don't know about the world famous part though lol). It was fun to get to chat for a bit and I'm so glad you came by!! PS - the blog looks super cute!! I am Thankful for...A History Lesson! Welcome to the Whole NEW Asylum!